MAY DETERMINE THE DOLLARS YOU RECEIVE WHEN THE CHECKS ARE WRITTEN. You have experienced a Motorhome/RV Fire loss to your motor home, travel trailer, fifth wheel or tent camper and now you need to be made whole. If you have insurance the insurance company will work out a settlement with you on the loss based upon your policy (if you and the insurance company cannot come to an agreement on the amount due you then you may want to explore the appraisal clause process. See certified appraisals). If you have an additional monetary loss that is not covered under an insurance policy, such as a buildings, personal effects, motorized vehicles, etc. then you need to seek a remedy, that being for you to conduct your own independent Certified Motorhome/RV Fire Origin & Cause Investigation to collect the dollar amount from the negligent party. An insurance company will most likely want to conduct a Certified Motorhome/RV Fire Origin & Cause Investigation which will hopefully find the negligent party so they can recover their loss. This procedure is handled through the Fire Subrogation Department. So where does it leave the owner/insured? The owner/insured is generally not entitled to the results of any insurance company Motorhome/RV Certified Fire Origin & Cause Investigation. 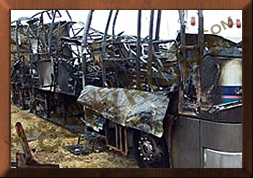 If the finding of the Certified Motorhome/RV Fire Origin & Cause Investigation does lead to litigation then the Certified Motorhome/RV Fire Investigator can usually only represent one party. The insurance company paid for their part in the Certified Motorhome/RV Fire Investigation and they are looking to only recover their loss pursuant to the policy. If the owner/insured wants to recover a loss then they must have their own Certified Motorhome/Fire Origin & Cause Investigator present at the Fire Investigation in order to represent their interest. If a claim is made to a Motorhome/RV manufacturer for a loss by the owner/insured one of the first request of a Motorhome/RV Manufacturer will be, “provide us with a Certified Motorhome/RV Fire Origin & Cause Investigation Report showing we are negligent”. If you cannot provide evidence to substantiate your position, then you most likely have no case and no recourse. On the other hand the insurance company will have their Certified Motorhome/RV Fire Origin & Cause Investigation Report and will attempt to collect. After the fire department has left, leave the burnt Motorhome/RV in its present location if at all possible. If it must be moved then tell the towing company in no uncertain terms that all debris, especially what has fallen beneath the burnt Motorhome/RV, must be protected and preserved. If they fail to protect, then they may be responsible for the loss, especially if spoliation issues rise. DO NOT TOUCH ANYTHING AROUND OR INSIDE THE MOTORHOME/RV AND MAKE IT CLEAR NOBODY IS TO GO ANYWHERE NEAR THE FIRE DAMAGED MOTORHOME/RV. YOU OWN IT, AND YOU DECIDE WHAT HAPPENS TO IT UNTIL THERE IS A SETTLEMENT. If you make a Motorhome/RV Fire Claim then you must allow an insurance company representative to visually look at the burnt Motorhome/RV but under no circumstances are they to disturb the condition of the Motorhome/RV Fire Scene. Protect the Motorhome/RV from the elements of the weather. The insurance company may or may not know to do this. Remember you own the Motorhome/RV. 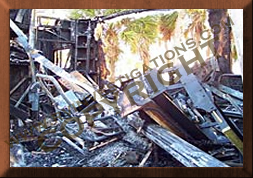 If you wish to proceed with collecting the total amount of loss less what the insurance company will pay under the policy then you must proceed in obtaining your own Motorhome & RV Certified Fire Origin & Cause Investigator. Most Fire Investigators don’t understand the complexity of a Motorhome/RV. Having two, three or sometimes four different electrical systems, how LP gas is installed in the Motorhome/RV or how to conduct test on certain questionable components that may be suspect. A Certified Motorhome/RV Fire Expert is critical in you finding out the “Motorhome & RV Fire Cause and Origin” and you not just hearing “it’s undeterminable” and you cannot recover your full loss. Once you have your Certified Motorhome & RV Fire Origin & Cause Investigator he or she will be in charge of the Fire Investigation. A date and time will then be set to conduct the Intrusive Certified Motorhome & RV Fire Investigation and to legally notify all interested parties. at your service to conduct Certified Motorhome/RV Fire Origin & Cause Investigations anywhere throughout the United States and abroad. Remember you own the Motorhome/RV and the decisions you make regarding its disposition may decide whether you are made whole or not. Will a Fire Department Report work for me? Fire department reports provide information about when Motorhome/RV Fires are called in, who responded, how long it took to extinguish, and if Motorhome/RV Fires look suspicious. Their reports generally do not provide definitive determination as to Motorhome & RV Fires, more particularly the Motorhome/RV Fires origin & cause. How long before there is a Motorhome/RV Fire Investigation? Usually a date and time is set at about 2-3 weeks. Why does it take so long? All possible negligent parties must be legally notified. Do I have to be present? No, but it is a good idea as questions may arise as to the sequence of events leading up to the Motorhome/RV Fire that only you can answer. I have some personal items left in the Motorhome/RV can I look to see if they are still good? It is not a good idea to enter the Motorhome/RV Fire Scene unless you are accompanied by the lead Motorhome/RV Fire Origin & Cause Investigator. The lead investigator will determine if you may enter. Should I take photographs? Taking photographs can be helpful especially if they were taken during the fire. What about my records? If you have your Motorhome/RV Service Records make a copy and offer them to the Certified Motorhome/RV Fire Origin & Cause Investigator. He or she should ask for them prior to any Motorhome/RV Fire Investigations. Can I talk to my neighbor or a friend about the Motorhome/RV Fire? It is best not to. Your discussion as to what you observed and what you did should be limited to the fire department, law enforcement and your Certified Motorhome/RV Fire Origin & Cause Investigator. 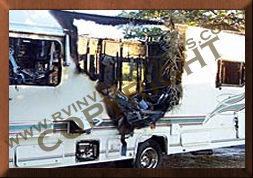 How much does a Certified Motorhome/RV Fire Origin & Cause Investigation cost? It depends on the geographical location of the Motorhome/RV Fires. Contact our office for a price quote. When the Motorhome/RV Fire Origin & Cause Investigation is done what happens to the collected evidence? We have evidence storage at our facility. Should I contact an attorney before the Intrusive Motorhome/RV Fire Origin & Cause Investigation? An attorney is generally a good idea but most clients wait to find out what caused the fire and who might be negligent. That way the attorney will have what he or she needs in a Certified Motorhome/RV Fire Origin & Cause Investigation Report in order to pursue your just compensation. RV & Marine Investigations of America, LLC.